Here is another craft idea. 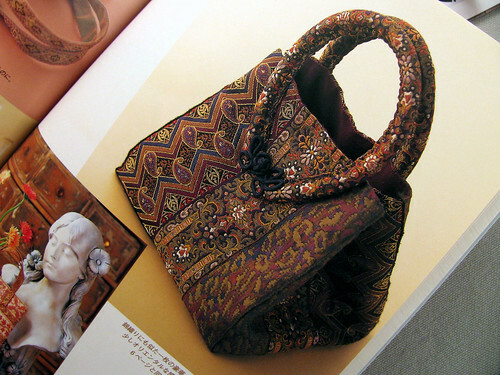 It is a little bag made from fancy ribbon. I bought this Japanese craft book many years ago. At one time in the few blocks that make up Little Tokyo in Los Angeles there were lots of bookstores and other nice shops. Now however it is really touristy and has only one bookstore which is part of a chain. I bought all of my nice doily books before the other bookstores went out of business. I got this craft book for almost nothing at one of the going out of business sales. It has lots of photos for all the techniques. I especially like the ribbon covered handles on the bag below. I think anyone who sews can figure out how to sew the bag pictured without the book. The book shows a black rubber tubing inside the handles, but I think aquarium tubing would work too. Just an idea I wanted to share and hopefully it is helpful to someone. There are so many pretty ribbons available, just think of all the pretty bags that they could make. This entry was posted on Saturday, January 3rd, 2009 at 3:00 am and is filed under Craft and Sewing. Tagged: Book, Craft, Ribbon, Sewing. You can feed this entry. You can leave a response, or trackback from your own site. That is really pretty! I love the shape of it too.